About 48" (122 cm) long and 12" (30.5 cm) tall. The tragic events at Sandy Hook Elementary in December 2012 affected me deeply. Searching for comfort knitting, I decided to knit a Namanu Shawl in memory. I was startled to see that the pattern called for almost the same number of dolls (27) as there had been victims (26). Sarah Dimond of Plucky Knitter chose colors for the girls, boys, and teachers, plus an additional color for the 27th doll to represent “those who remember.” Knitting the shawl helped me feel better, and I thought about every one of the people lost as I added the dolls to the border. At the same time I was knitting Sandy Hook, Bobbie was working on the Tawanka Variation (page 150) and mentioned that she’d like a “pointy” edging for her shawl. I went to my trusty Barbara Walker library, and modified the Queen’s edging. I test-knit the edging on Sandy Hook, using color for “those who remember,” and loved the way it enveloped the dolls. The result is a garment that’s very special to me and a testament to the way knitting can help us honor and love others. Note: There are several versions of the Namanu shawl in the book. None of the patterns in the book are being released or sold separately. Every one of the Namanu shawls is very personal to the knitter who designed it, and I expect people will be making their own versions, not duplicating ours. The reason I included the pattern in the book, and didn’t hide the origin of my inspiration, is to, firstly, honor the victims of the tragedy and secondly, to show that the motifs can represent anything that has meaning for the knitter. 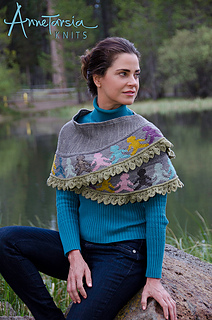 The paper dolls in the Namanu shawl can represent anything - fishermen, children, or gingerbread men, and the number of motifs can be changed as a knitter wishes. 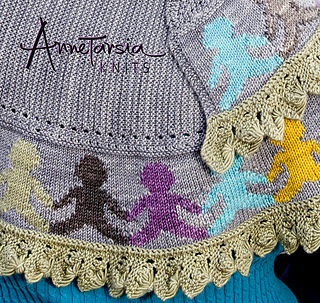 Annetarsia allows knitters to express themselves in their knitting, which I think is very empowering.